In this article, we are designing a form, in which we will display text that is input in the TextBox in the MessageBox using Button Click Event in C#. Here, we took two controls on windows form that are TextBox and Button, named txtInput and btnShow respectively. 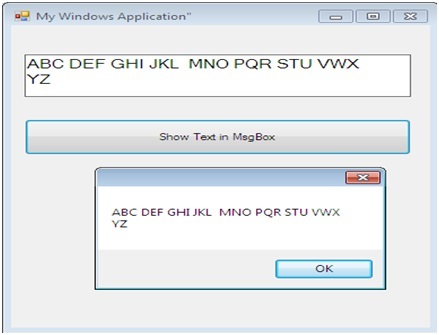 We have to write C# code to display TextBox’s text in the MessageBox on Button Click. In the above application, we wrote code on button click event to show text in MessageBox entered in TextBox.